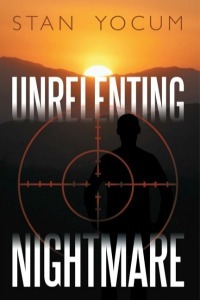 The following is a guest post by Stan Yocum, author of Unrelenting Nightmare. If you would like to write a guest post on my blog, please send me an e-mail at contact@cecilesune.com. My creative inspirations often come from my mind’s eye. I begin to write a scene, describing characters interacting with one another, and as I continue my mind starts visualizing the scene. I can see the characters talking, and also the anger or joy on their faces. Likewise, I can see their physical movements, which could indicate kindness, irritation, indifference, or even love. From the visual images in my mind, the scene will start to come alive. I type as fast as I can to keep up as the scene unfolds. Now I will say, as an author I certainly know the intent of the scene before I ever start writing it, it’s just that many times the scene takes on a new life as it develops in my mind’s eye. As I see a character’s sudden anger, I might alter my initial feeling as to how the scene should progress because I have now witnessed a change. In my novel Unrelenting Nightmare, I have a character named Nomed that dominated my mind’s eye when I created him. His character is complex, mainly because of his personality and the many people he portrays (you’ll have to read the book to understand exactly what I’m referring to). Anyway, I had fun watching him develop as I wrote the story. Editors have told me that I don’t need to put physical mannerisms in my scenes; readers should be able to figure out what’s happening through dialogue assuming it’s well developed. But I add descriptions of characters throwing an arm over the back of a chair, or crossing their legs, or smirking at a comment another character makes, which I do to indicate a characters emotion. I do this to let the reader “see” the attitude of the character. I suspect my writing tendency was brought on from being an actor. As an actor, I created gestures and physical mannerisms in developing each of my characters. I would spend hours figuring out how a character got to the point of when the play starts; his prior life, his childhood, his fears, what he likes and doesn’t like; all the things I could imagine that made him the person he is. As I did, I would visualize how this might affect his physical mannerisms. Did he have a nervous twitch, or maybe a smile that never left his face, or possibly no emotions at all? All these things make up a character, regardless of whether you’re developing one for the stage or a novel. So when I’m writing a scene and see a reaction of one of my characters in my mind’s eye, I quickly jot it down, thinking it will help the reader understand how he or she feels at that moment. About the author and his work: Stan Yocum’s Website.